Fortress of Spinalonga is part of the Tentative list of Greece in order to qualify for inclusion in the World Heritage List. Greece’s apparent intention to nominate the “Fortress/Leper Hospital Island of Spinalonga” on Crete for 2020 continues its policy since 1999 of not putting forward any of its numerous uninscribed ancient sites. In Dec 2018, we made a somewhat unsatisfactory visit to it in the form of a boat trip round the, otherwise “closed for the season”, island (photo)! Nevertheless we felt that this limited visit plus subsequent investigation has enabled us to extract most of the “value” offered by the site. This first review of it should at least help WHS travellers when tracking its progress through to the WHC as well as deciding whether and how best to visit it. The small “islet” (a walk round it is c 1.5 km) is nicely situated at the entrance of the Gulf of Elounda towards the Eastern end of Crete - a 1.5hrs drive from Heraklion. It effectively “blocks” the seaway and was an obvious site for a “Fort”. The one “on show” is largely Venetian - built and occupied by them from 1578 - 1715. 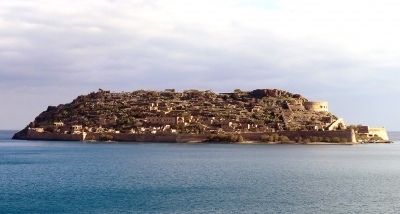 The T List description on the UNESCO Web site “bigs up” the “unique” design aspects (“Compared to other fortified islets around the world......the islet of Spinalonga stands out as the only example of an advanced asymmetric layout of the main fortification element, the seaward Michiel demilune”). But, to the non-specialist, it looks like just another fort - albeit in a picturesque island location. We saw a number of others on Crete, and of course there is the already inscribed “Venetian Works of Defence” with its 6 locations running down the Adriatic coast. The Comparative analysis for that nomination considered in some detail what its geographic extent should be and concluded “It is proposed that this nomination should extend from the Stato da Terra to the Western Stato da Mar (centred on the Adriatic Sea), leaving open the potential for a future nomination of important examples from the Levant Stato da Mar (centred on the Eastern Mediterranean).” This latter could include forts on Crete – and surprise, surprise, Greece does indeed have another T List site titled “Late Medieval Bastioned Fortifications in Greece” which includes 2 of Crete’s other (partially) Venetian fortresses (at Chania and Heraklion) as well as the, already inscribed, fortresses at Corfu and Rhodes!! It does not, however, include Spinalonga - though that does get a mention in the Comparative Analysis for the “Venetian Works of Defence”. It is dismissed there as only possessing 2 of the 7 characteristics demonstrated by its own nominated forts (the “Late Medieval Bastioned” locations were regarded as possessing 4 of them). Based on such assessments, Spinalonga doesn’t really seem to cut it as a “Fort” - and, in all honesty, the “List” has no need of yet another "run of the mill" example. (This web site page contains a nice addressable map of Venetian fortresses in the Aegean area including Spinalonga). What sets Spinalonga apart from all those other “Forts”, both Inscribed and on the T List, is its use from 1903-57 as a leper colony (originally under “autonomous” Crete which didn’t unite with Greece until 1913). As our “Connection” shows, there are 4 WHS (at least?) with a history of being a leper colony. 2 of these were “modern” - "Robben Island" and "Great Barrier Reef" (Fantome Island) which continued to “operate” until 1930 and 1973 respectively – but only the former mentioned (and then only obliquely) that aspect in its nomination (The latter of course is within a purely a “Natural” WHS). I also looked up the T List entry for Schweitzer’s “Lamborene Hospital” in Gabon and was surprised to discover that no specific mention is made of its role in the care of leprosy sufferers, nor of the separate “Village Lumiere” (scroll down to reach separate paras on Hospital and Village) which acted as the leprosarium and which may or may not be included. So - whilst Spinalonga isn’t “unique” as an inscribed or T List site which had a "Leper Colony", it does possess at least a certain “surprise” value to discover that such a use continued in Europe through to the 1950’s. And, despite many years of “ruination”, much of it does remain - whilst Fantome, for instance, was deliberately burnt down. The first effective treatment for Leprosy/Hansen’s Disease was only developed in the early 1940s and this led to a reduction of new sufferers and improvement/control for existing ones. This, together with improved understanding of the disease, effectively ended the “medical” (if not cultural) reasons for enforced isolation of sufferers. However, use of the island for the long term inhabitants continued, significantly because of their own preference and also for lack of alternatives. After many years in which they were inhumanely treated they had, in latter years, established a “safe” community which they were reluctant to leave - particularly given the problem of how to return to a conservative society where they would be isolated and shunned. Indeed the final closure and transfer of (some of?) the remaining inhabitants to an institution outside Athens was not a good result for them! But does Spinalonga’s proposed OUV derive primarily from being a “Fortress which was later used as a Leper colony” or a “Leper colony which was situated in an old Fortress” or an equal mixture of both? In fact, 3 of the 4 Criteria claimed in the T List entry relate to its Fortifications - which, given the “competition” from existing WHS and T List Forts, does seem to be a bit hopeful! I wonder if ICOMOS will find much value in them? However, given recent WHCs, does it even really matter what ICOMOS determines when faced by a WHC with political games to play! And what of a visit? Well this is Crete’s second “biggest” attraction (after Knossos) in terms of visitor numbers - as indicated by the large car parks at each of the 3 main departure points. Crete gets over 4 million tourists pa and, whilst most go for beach resorts and bars, many also visit Spinalonga – reaching up to 4000 a day in July/Aug! Larger boats depart from Ag Nikolaos and Elounda but we continued in our rentacar to the (very) small, and much closer, fishing village of Plaka. There, an empty ticket booth advertised a cooperative of 19 boats! But there was only 1 at the quay, with the owner sorting out his nets and offering “Fishing trips”. We were the only other people there! The island is closed from November to March (Some, but not all, web sites indicate that it might also be open on the first Sunday of each month during that period, but …..?) so this boat was the only way we were going to get closer to the island and we negotiated a trip round it - but he said that he couldn’t allow us to even set foot on the island’s jetty! Nevertheless, even from the sea, we got a good impression of the island’s fortifications and some of the buildings remaining from its use as a Leper colony. Many were clearly still in ruins. I have read that, during the period between the colony’s closure to its establishment as an “archaeological site” in the late 1980s, the colony buildings were both vandalised and looted for building materials. Contemporary photos of the “main street” show a number of reconstructed buildings operating as shops etc. There is apparently a small museum and a church. Graves of lepers who died there are also on show. After many years during which the Greek government wanted to forget the island, destroyed records and allowed it to decay, more recent times have seen a complete turn around – leading of course to this Nomination! The island’s “popularity” has been increased by the fact that it has been the location for a number of successful novels/turned TV series/movies describing a Crete now long gone e.g “Who pays the Ferryman” (MJ Bird) and “The Island” (V Hislop). It is also something of a “Thanatourist” destination and has figured in an eponymous horror story by J Ware. There is also “Vies et morts d'un Crétois lépreux” by S Remoundakis, a leprosy sufferer who was credited with mobilising the residents and gaining improvements to living conditions in the 1930s. a. “The Island - the True Story” - a semi dramatised history of Spinalonga as a Leprosy Colony (2011. Eng sub. 46 mins). For anyone who is interested in the island or has been/is intending to go, I would particularly recommend this one. b. “Letzte Worte” - An early (1968) B+W “short” (14 minutes. Sp subs - I can't findEng/Fr) by Werner Herzog (Yes – him again! ), is “about” (if it is “about” anything in its surrealist, melancholic way!) “the last man to leave the abandoned island of Spinalonga, which had been used as a leper colony. The man refused to leave, and so was forcibly removed. He now lives in Crete, where he plays the lyre at nights in a bar, and refuses to speak…..” (Wiki). If you "stick with it" it shows the state to which the Leper hospital area had degraded 50 years ago as well as the cultural aura which surrounded the idea of having once been an inhabitant there. c. "Spinalonga 1927" and "Spinalonga 1935" - 2 frustratingly short (2 min 21 and 3 min 46) B+W films, taken when the colony was still functioning. d. "L’Ordre" – a self consciously arty French movie with many unnecessary longeurs, set in both Spinalonga and the Athens “hospital” where the remaining residents were moved to (and were very unhappy!). It contains repeated video “walks” through the island as it was in 1973. If we had been able to get ashore we would no doubt have gained a better direct appreciation of what life was like in the colony. Ah well – it wasn’t to be and I can’t see us returning to do so!! I am happy enough with the views we obtained and the extra insights gained from later research and am not sure I would even want to visit in high season! And its chances of eventual inscription? Probably, albeit with a reduced range of Criteria to concentrate on its Leper Hospital role. Its 17th C fortifications would seem to possess no real "OUV" when such remains are so common. However, their physical and metaphorical presence give the later remains of the "colony" a valuable extra dimension in the form of "Island as prison" which speaks to our instinctive fears of a disease which, even if has been conquered medically, still has a deep cultural resonance.